Virtualized in Software: While this can support an unmodified guest OS, many operations are emulated and slow. Apps may run 2x to 10x slower, or worse. Paravirtualization: The hypervisor provides efficient hypercalls, and the guest OS uses drivers and kernel modifications to call these hypercalls. It's using software and coordination between the hypervisor and guest to improve performance. I'd expect measurable overhead of 10% to 50% (depending on the PV type and workload). Virtualized in Hardware: Hardware support for virtualization, and near bare-metal speeds. I'd expect between 0.1% and 1.5% overhead. 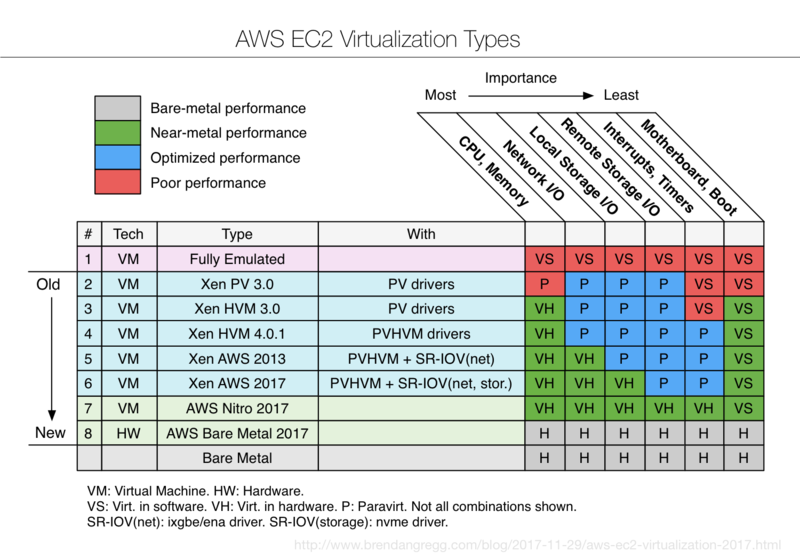 This entry was posted in AWS, Cloud, Computer, Hardware, Murmuring, Network and tagged amazon, aws, cloud, ec2, hvm, hypervisor, kvm, pv, virtualization, xen on December 2, 2017 by Gea-Suan Lin.